Ultimate Flowers are homeopathic, Spagyric preparations of the emotional flower remedies that were initially attributed to D r. Bach. These quasi-nosodes are all in the 30C potency and were designed specifically to be custom potentized or custom grafted but can also be used as a stand alone remedy. EAV practitioners can find the specific flower remedy in their instruments and imprint the frequency(s) into the Ultimate Fields thereby fully customizing an emotional remedy for the patient without having to give the patient several different remedy bottles. Other practitioners may wish to “graft” from a flower remedy (3 drops) into the Ultimate Fields to accomplish a somewhat similar purpose. For example “graft” 3 drops of Cerato, Holly and Cherry Plum into the Ultimate Fields. 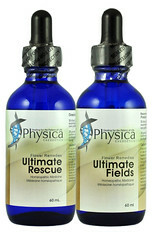 Note: Pineal 6C and Thymus 6C sarcodes have been added to the Ultimate Fields and Ultimate Rescue. The pineal gland is the focal point for the endocrine system through which the Vital Force specifically differentiates and the thymus gland represents the subconscious access and pathways. ATP 5X is present for homeopathic empowerment factors/Krebs cycle.